Ox Drove, Nr Wylye Wiltshire. Reported 16th June. There was death and destruction both north and south. Then a truce was declared; then peacemaking was conducted. Let there be on throne on Nibiru, one king to reign over all. Deshi Basara! We rejoice in gratitude with all the Native Americas� unwavering heart, that is reempowered by Lady N�nki to lead all the nations to the Fifth World. God bless Turtle Island and the British Isles! Independence, now, rise! (Blog) Please view (PDF) (Download) our geodesic-astronomic analysis on this genuine manifestation, thank you. 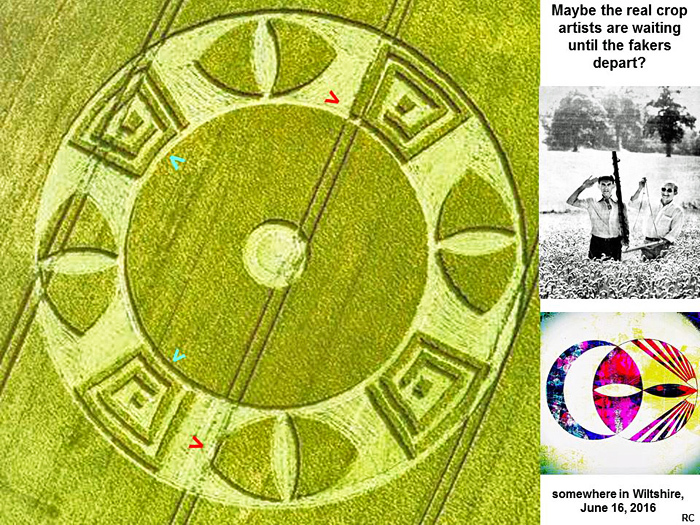 This crop circle appeared June 16, 2016 - near hiking trails Monarch's Way. 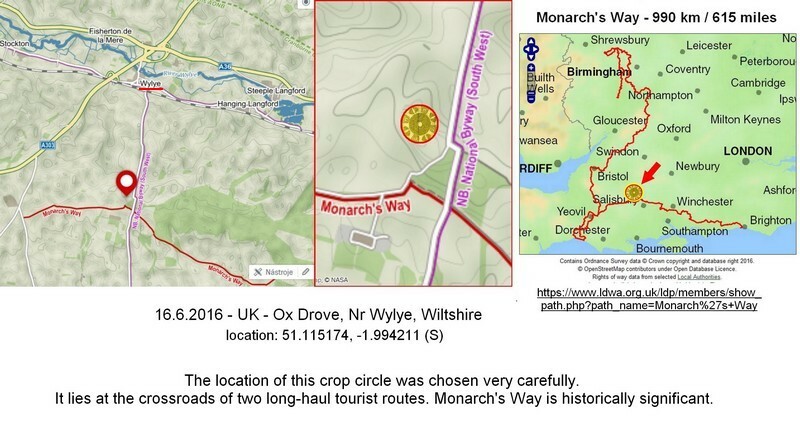 The route follows the long journey of King Charles II. while fleeing from England into exile at the end of the civil war in 1651. The entire route has a length of 615 miles, it is 990 km, and is connected to other long-distance journeys. Tourists watch a lot of historical buildings of antiquity. This location and the date of 16 June 2016 is certainly no coincidence. Dominated by the number 6 and 16 reminds us of the events during the reign of Charles I., then his son Charles II. in England. Europe at that time convulsed in religious Thirty Years War (1618 - 1648) and in England raging civil war (1642-1651). Charles I of England - King of England, Scotland and Ireland from 27 March 1625 until his execution Jan. 30, 1649. England then became a republic and ran the country for the Lord Protector Oliver Cromwell. Scotland was an independent kingdom. February 5, 1649 Scottish Parliament appointed the son of the executed king King of Scotland. Charles II. He was crowned as the Scottish monarch January 1, 1651. In the same year he went to England with the Army against Cromwell. In the battle of Worcester September 3, 1651 but was defeated and was forced to retreat into exile. After the death of Oliver Cromwell in 1658 occurred in the country's political crisis, which has led to the fact that Charles II was asked to come back to England and took the throne. So restored the monarchy. April 23, 1661 was crowned. England and Scotland became a constitutional monarchy. Under his reign, England had to soon face another disaster. In 1665 it was the Great Plague of London, and soon thereafter in 1666 Great Fire of London. During the Civil War lost England, Scotland and Ireland about 10% of the population. Europe during the Thirty Years' War lost about 30% of the population. It seems to me that the remembrance of this troubled period is nowadays very topical. After a referendum on Britain to remain in the European Union June 23, 2016 UK union leave. The result is irreversible. This is probably a harbinger of other dramatic events. Julius Caesar introduced the Julian calendar on January 1, -44 (historical the year 45 BC when the year 0 is excluded). On October 15, 1582, this was refined by the introduction of the Gregorian calendar. Nowadays many people believe this calendar is just an �artificial� way of time reckoning, but this formation shows this is not the case. 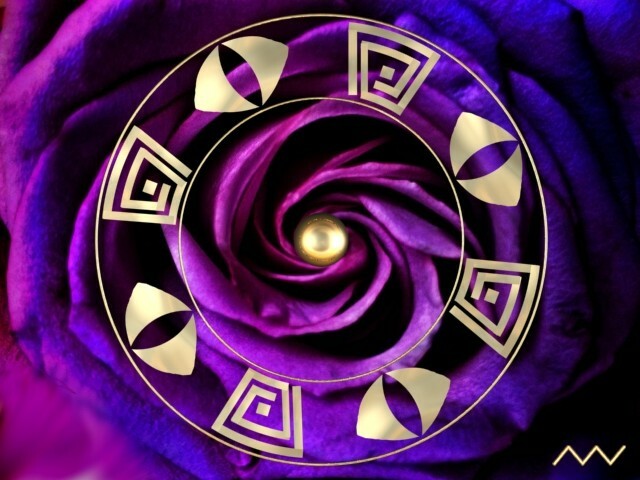 The formation shows four symbols that are spirals and are a symbol of creation. The other 2 � 4 = 8 symbols reflect the relationship with the moon, especially the lunar month and as I will explain, multiples of 8 or even 4 � 8 lunar month relate to the Julian and Gregorian calendar. The introduction of the Julian calendar in fact already happened on October 12, -46 regarding the proleptic Julian Calendar. This was January 1 in the still existing Roman Calendar and the start of an extra long calendar-year, officially meant to realign the start of the calendar-year (January 1) with the winter again. However, this calendar-�year�, in history known as the last year of confusion, also precipitated the true start of the Julian Calendar 445 days later (January 1, -44). The Gregorian calendar started precise 1628 years after the beginning of the last year of confusion on October 15, 1582. This was, classically spoken, also the same day referring the so-called Tzolkin-calendar. This shows the relationship between both. 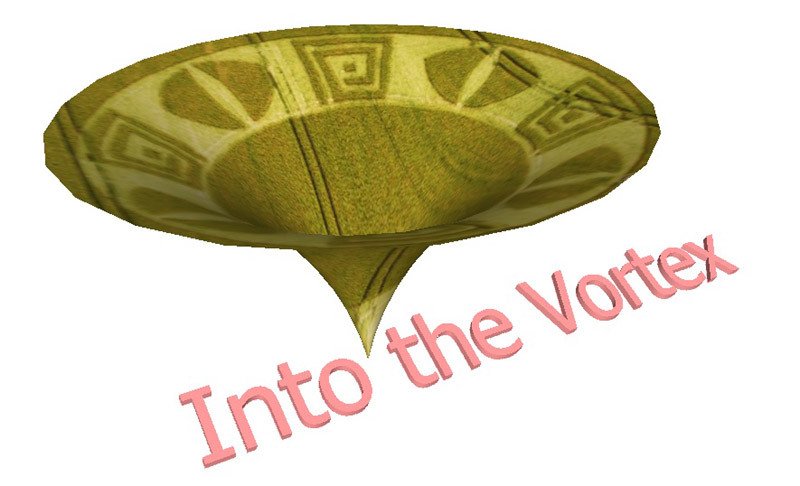 As many crop circles, amongst others, demonstrate that the so called nine Underworlds will end on October 28, 2016, it is interesting to find out if there may be a connection with the introduction of the Julian calendar (the year of confusion) and/or the Gregorian calendar, which were introduced both in October according to our present day calendar. It turns out that the time span between the factual start of the Julian calendar on October 12, -44 and October 28, 2016 comprises exactly 4 � 8 � 797 lunar months (also almost exactly 2062 sidereal years). The time span from the start of the Gregorian calendar on October 15, 1582 until October 19, 2016 (thus short before the end of the Underworlds) not only comprises exactly 671 � 8 lunar months, but also exactly 434 sidereal years. Surprisingly, in both cases we find a result that is a multiple of 8 months (or even 8 � 4), while there is also a connection with reference to the sidereal year (which is slightly longer than the tropical year of the Gregorian calendar as this is based on the relationship with the true sidereal zodiac instead of the tropical year). The formation expresses the connection with 8 or 4 � 8 lunar months. In practice, the date on which the formation is created supports the message of the formation. 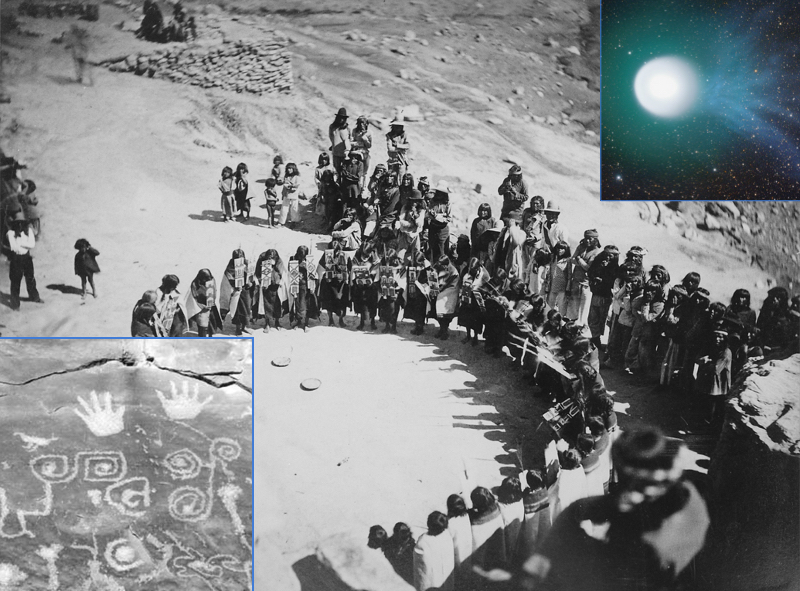 However, for reasons of feasibility, the crop circle makers didn�t make a connection with for example the start of the last year of confusion, nor with January 1, -44, but created the formation exactly 199 � 2 � 8 � 8 (or 199 � 4 � 4 � 8) lunar months after January 1, -43, precisely one year after the true start of the Julian calendar. Hence, in this case, there is even a relationship with 8 lunar months as well as 4 lunar months squared, something that happens only ones over more than 10 years! Moreover, 4 � 4 � 8 days after the formation�s creation date will fall on October 22, which, classically spoken, is the last day of the Tzolkin-calendar, short before the end of the Underworlds. There is also a connection with the end of the creative power of the Gregorian calendar, because 2 times this time-span (thus 4 � 8 � 8 days after the formation�s creation date) refers to February 27, 2017, one day after the annular eclipse of February 26 and one day before the end of the month. 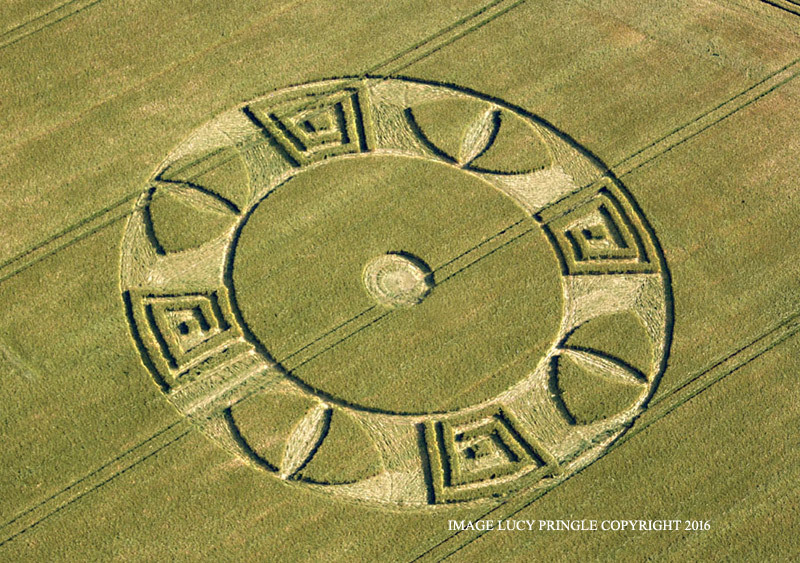 February 28, 2017 is the date of which quite some crop circles show that this is the �end-date� of the Gregorian calendar: it closes the circle of the creative power of this calendar. The Romans introduced the Julian calendar. Hence, it should be no surprise that the location of the formation is very close to Roman archaeology. A Roman road runs through Grovely Wood, close to the formation. At the West-end of Grovely Wood, very close to the formation, there are the Iron age/Romano-British settlements of Hanging Langford Camp and Church End Ring. 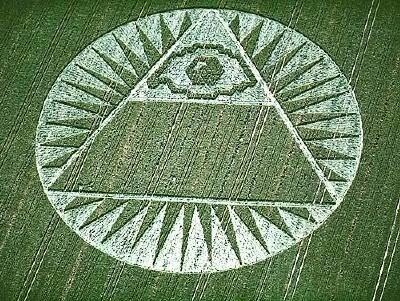 I see 4 pyramids from the top down (4 corners of the earth, 4 corners of the universe) and 4 all-seeing eyes. 4 is symbolic of "all points covered". The circle at centre represents cosmic-source energy from the universe as well as from heightened gamma ray activation of our sun. What is the sun activating, and with what result? As my sense is that all crop formations now speak of mounting energetic transformation of earth and our species leading to a peak quantum moment of awakening (many say some time in 2017)-- and there is only a short window of earth "time" left before that moment, now is also the moment when earth's energy accumulators which pyramids are, will also play a heightened role assisting this awakening and transformation. How? From this perspective, I perceive this crop circle / formation is telling us that all pyramids worldwide are being brought online once more to reconnect us energetically with the cosmos around us as in ancient times, their powers restored as ascension and initiation and time-travel devices; as power generators supplying gardens and homes and vehicular transport in any direction, vastly altering our reality and elevating us to standards we lost but now are being restored--free energy that can "do all things". I found this image below of something linear to correlate - we see the sun, a pyramid and an all-seeing eye. Yes it was hijacked by those who opposed the divine plan of wellbeing and abundance for mankind, but when the hijackers are soon departed, the original intent and purpose of our divine heritage will belong to mankind once more as originally intended. I was wondering why what I believe to be the 4 all-seeing eyes were formed separately in between the pyramids (seen from the sky as it were, top-down) and not somehow worked into the 4 pyramids themselves. Reason 1 -- would be too cluttered, confusing, obfuscating the message? now, today, this moment when mankind is ready to take its power back. We are ready NOW. The photo discloses geometrical defects, a characteristic of manmade circles. The four lens-like figures have never appeared this way before. They may be eyes, not human, but alien (of Earth or otherwise), observing the four minor fragments spiraling down to Earth. There isn�t a discernible reason for the four spirals to be rectangular, rather than circular, other than the suggestion that they belong to the four chastising comets (GBR (03/08/01), pg. 175 for example). The center circle indicates an impact site for one comet, or perhaps four, but it is during daytime, while the four fragments in the outer region appear to fall during nighttime. The circle may mean that the aliens will be observing the fall of even minor fragments during the night in addition to daytime. The page reference is in the free ebook at http://theheckhypothesis.com/aboutthebook.html.